Zuzana from Beamsville sent us a Possum picture and said ..... I was walking the dogs in the vineyard yesterday and they found him. They didn't harm him. They were inspecting him, but let him be. Very interesting creature. Just growling and showing teeth. Phyllis wrote to tell us of her sighting ..... I just saw one small one in my backyard in Ridgeway, (Fort Erie) Ontario. He does not seem to be afraid of humans, and he is alone. A reader from Lambton Shores wrote to us to say ..... Saw my first Possum while at the cottage around 10:00 pm. I was surprised and decided to check online to see why I had seen a Possum in Ontario. Joe Dasilva from Bowmanville wrote to tell us ..... I've trapped 2 opossums living under my deck. They've been in my composters. Now I have another one living under my deck. The west beach area of Bowmanville seems to be an area where they thrive. Lake Ontario is on the south side of the property and the bowmanville marsh is on the north side. Wendy from Lasalle, Ontario, wrote to say ..... I have spotted a large Possum in the early morning hours strolling through our backyard and have seen several on the side of the road (not living). A reader from Oakwood, Ontario says ..... I have a possum sitting in my chicken coop. My dog grabbed it, and it truly "played possum." The dog grabbed it and then walked away. It was really interesting to see it do this. Laurie Ward from Newcastle, Ontario said ..... Possum sighted crossing the road in the Port of Newcastle at 9:00 pm November 1 2013. 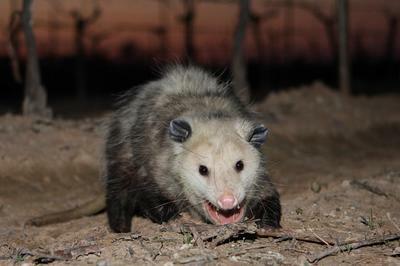 Lina, from Mississauga wrote to tell us of her Possum sighting ..... On February 18, 2014 I was leaving my house and almost hit a rat-like creature that was crossing the road. It turned out to be a Possum. It hissed at me and it looked like it was dead. I never hit it with my car, so I thought the poor thing had a heart attack. I got out of the car picked it up and put it on the side of the road. I was waiting for the possum to get up and run. But it looked even more dead. Since it is my first encounter with a possum and I was not aware of its ways of playing dead. I waited for couple of more minutes and it was still not moving, so I left hoping that poor this is alive and OK.
A reader from Wasaga wrote to tell us ..... Our dogs were very upset, upon investigating we found a Possum in our flower garden. What a surprise!! Do we chase it away or leave it be? We live just north of Barrie, Ontario on a farm. We have decided to let him be, maybe he will be around tomorrow night. Thank you to all our readers who wrote in to tell us about sighting Possums - my apologies if it has taken a long time to get them posted on our website ..... we get many submissions each day and we got W-A-Y behind! Thank you Zuzana for sending us your lovely picture of your Possum!